Brisbane, Oct 18, 2018 AEST (ABN Newswire) - Oventus Medical Ltd ( ASX:OVN) is pleased to announce that new clinical data from four separate studies on its Sleep Treatment Platform will be presented at Sleep DownUnder, the 30th annual meeting of sleep specialists, taking place in Brisbane between 17th -20th October. 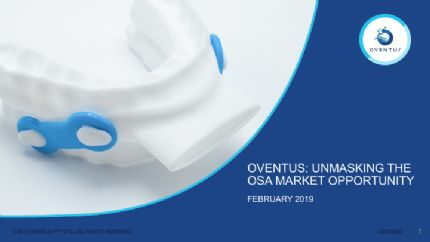 Clinical work across multiple trials, through which 170 patients have been treated, shows Oventus' devices successfully treat more than 75% of patients without the need for Continuous Positive Airway Pressure (CPAP), the standard of care treatment for sleep apnoea. 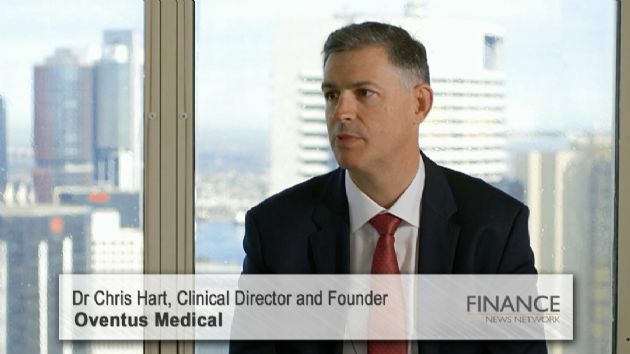 "We have seen a dramatic improvement in our patients in clinical trials," said Dr Chris Hart, CEO of Oventus. "The technology in these devices eliminates the need for full face masks and greatly improves treatments for the majority. We have been consistently delighted with the results." Sleep Down Under is the scientific meeting of the Australasian Sleep Association (ASA) and Australasian Sleep Technologists Association (ASTA). The event brings together expert sleep clinicians and scientists to share the latest advancements and innovations in the world of sleep research and clinical practice.